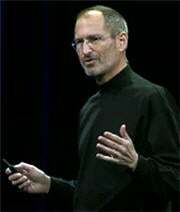 Steve Jobs has turned up the hype for his WWDC 2010 keynote. The conference for Apple developers begins June 7, and Apple's chief executive has emerged once again through e-mail, saying Apple fans "won't be disappointed" and that there's "Not a chance" Google's Android is surpassing the iPhone. Gizmodo knocked the wind out of Apple's biggest potential WWDC news, the launch of a new iPhone. What we know so far is that the phone's hardware improvements -- most notably a front-facing camera and higher-resolution screen -- will bring the so-called iPhone 4G up to speed with the latest Android phones. To avoid disappointment, the next iPhone needs a killer feature. Maybe it's the rumored touch-sensitive back panel, or something else entirely. I'd also like to see a different, more palm-friendly design than the one spotted in prototype. A beta for iPhone OS 4 hints of AT&T support for iPhone tethering, at long last. I'm sure it won't be free, but $15 per month would be reasonable for a few gigabytes. To take it one step further, AT&T should make it super simple to buy a month of tethering at a time. The more AT&T tries to rope people into long-term commitments, the less attractive it'll be. wallpaper, and home screen folders this summer, probably soon after WWDC, but the update for iPad won't arrive until the fall. If there won't be any new features -- my unfulfilled wishlist for the iPad is mostly the same as with the iPhone -- I'd at least like to see the new OS in action on the big screen. WWDC is typically the venue for announcing new MacBooks and MacBook Pros, but Apple already took care of that in April. A new version of Mac OS X also seems unlikely, as Snow Leopard launched less than a year ago. What's left? Maybe a refresh of the MacBook Air, hopefully with better battery life. It's long overdue even if the ultrathin craze has passed. I still think that an iPhone for Verizon Wireless is unlikely to debut this summer, but rumors persist, and there's no denying that a Verizon iPhone announcement at WWDC would be a crowd-pleaser. If it happens, I'm calling it as Jobs' "one more thing" showstopper announcement at the end of his keynote.